The Peninsula Humane Society & SPCA is a rare bird in our field! We’re among just a handful of humane societies and SPCAs, worldwide, that extends its caring services to sick, injured and orphaned wildlife. Our patients come from San Francisco through northern Santa Clara County and include hawks, ducks, geese, songbirds, seabirds and mammals. 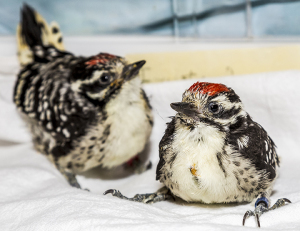 In addition, we give local residents humane solutions to their urban wildlife conflicts and treat animals impacted by environmental disasters, such as oils spills. While rehabilitating animals, we keep human contact to a minimum so as not to imprint, then release them. Typically, we successfully rehabilitate 1,200 to 1,400 animals each year, vital work made possible by generous donations. Please note that the Wildlife Rescue Office in Palo Alto (Middlefield Rd) is no longer in operation. If you wish to follow-up with a wild animal you brought to us for care or have a question about “nuisance” wildlife, please call 650-340-7022 ext. 414.